We sit down with the team behind Parkitect – finally, a proper theme park simulator! For Garret it’s been a fun challenge for art. There’s so much content that needs to go into a game like this, so it’s been fun figuring out a pipeline to build things and get them into the game as fast as possible. We’re also huge fans of simulation and builder games, and we basically grew up with things like RCT, Theme Park and SimCity. We’ve always wanted to make a game like them. 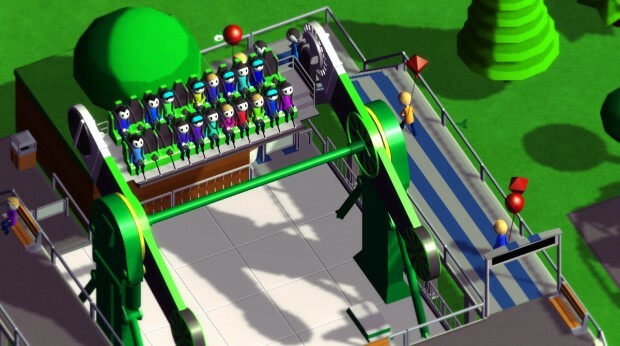 On the programming side, it helps that a lot of the content in this game shares some similarities – for example while each coaster looks different and works slightly different they can all mostly use the same code, oftentimes only requiring some parameter tweaks or smaller additions. There still are a dozen different systems and making them work together is challenging indeed, but that keeps it somewhat manageable. I puked on this ride as a kid. A lot. 2.) So you didn’t have any stretch goals, instead focusing on any overage going towards simply making the product better. How’d you arrive at that approach? Don’t you feel it might limit the number of backers? We did a lot of research and talked to other developers who’d done Kickstarters. We weren’t a huge fan of them to begin with and always thought they just caused overscope and financial problems in the long run. There’s a few articles out there from other developers that talk about running out of money or having to cut features they promised and we really didn’t want that to happen to us. To be honest it likely did limit the number of backers, which is perfectly understandable. However, we still hit our goal and we feel confident about making the game, plus we don’t have to worry about loads of extra features. 3.) How has it been working in Unity? Did any of you have any practice with the engine prior to this? We really enjoy it, as it takes care of all the heavy lifting and lets a developer focus on making the game. It lets us work really quickly on implementing new things and experimenting on features. You can also extend it as much as you want with scripts and stuff from places like the Asset Store or Unity Patterns, like custom editors and such. We’ve all had some kind of experience with it in the past, too. Garret’s used various versions of Unity and has made a few basic game prototypes in it. Gordon’s got experience implementing audio through Unity or third party software into Unity. Sebastian made a couple of prototypes to become familiar with how Unity works. It’s really been a pretty smooth experience so far. 4.) No game has tackled resource management with regards to shops. Why the decision to have a whole delivery and supply/demand system with shops? We felt that most of the guest-facing aspects of managing a theme park had already been done often enough by previous games in the genre, but what’s going on behind the scenes has never really been a focus. So we’ve especially been looking at what we could do in that regard. We’re also big fans of the early “The Settlers” games, where efficient resource transportation is quite important – and this just seemed like a perfect fit for our game! It works nicely with some other systems we’ll have, like keeping certain things hidden from your parks visitors. They don’t want to see your staff hauling resource crates around, so just like in real theme parks it’ll be important to build hidden passageways to keep staff out of the way of your visitors and let them quickly get from A to B. It’ll also be important for the player to keep the need for resource transportation in mind if he wants to build an efficient park and gives him something to optimize gradually. 5.) Do you plan on having a sandbox mode? How about a career mode? Yes to both. Sandbox is the one we’re currently working on, being the foundation for the rest of the game. We’re going to be doing career maps closer to release and after as updates for Early Access. 6.) Holy smokes! The 27 minute video of you building a ride was inspirational. Do you intend to do these periodically throughout development? Thank you! We’d definitely like to, and it was a blast to chat with all the watchers. We think it’s really valuable for development and shows that we care about our game. For the latest timelapse video we actually asked people which ride we should build on-stream, so that might be fun to do again. 7.) Are you planning to have maintenance be a part of the game? You will have to keep rides maintained, as they can break down and cause injury. How in-depth we go with that depends on what we feel is doable in the time we have and what is fun for the player. We’re experimenting with a few things at the moment. 8.) Do you intend to allow us to dig into the brains of our park visitors to see their intentions and motivations? It’d be fun, and would let us do some silly stuff with animation and random thoughts. So probably, yeah. 9.) For early alpha backers, when can we expect to see a build that we can tinker with and bathe in the bugs? For the early prototypes tier, you can expect those to come out in packs every couple of months until release. The first one should be in 3 months or so. We mostly need to get a proper user interface into the game for that, and more content overall. For the pre-Steam prototype version, that’ll be out a couple weeks before we hit Steam to help iron out some of the bugs and make sure we’re in good shape for the public. As for when we hit Steam, in about a years time. 10.) Are you planning on doing some of the more modern coaster designs? For example, inversions, free-fall drops, obscenely high, or rapid launch coasters. Oh for sure. We recently added a Wing Coaster to the game and people seem to like the look of it. There’s a lot of really awesome designs out there, but we want to make sure we have the classics too. 11.) With just 24 hours to go, where can readers go to back this incredible sounding project?